Left: At the mouth of Sucker Brook, geese gather on the expanding delta caused by soil erosion upstream. Right: Above: One of the LWTF's completed soil erosion prevention projects on Sucker Brook in Warren. 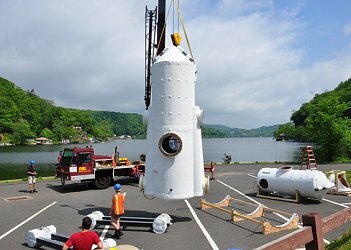 The Lake Waramaug Task Force has begun an ambitious and complex project to lessen the amount of silt that washes into the lake from several erosion sites along Sucker Brook. Sucker Brook is a scenic stream that meanders through the Warren woods and farmlands and provides Lake Waramaug with an estimated 50% of its water inflow. Depending on weather conditions, it can be characterized as a trickle or a torrent. Over the years, several sites have developed where the stream curves that have washed away much of the soil bank, undermining trees (and, in one location, State Route 45) and depositing tons of silt into the lake. The resulting delta that has been created in the lake has a damaging effect on water quality and aquatic life since it blocks the entry of cool water into the lake and disturbs the delicate thermal stratification that keeps harmful nutrients in the lower depths. The delta is also a safety concern for boaters. It continues to grow in size and is especially prominent during low-water periods such as we are experiencing now. Attempts to remove the silt have been deemed impractical until the upstream source of the problem is addressed. The process involves taking huge boulders, most excavated locally, and positioning them over heavy polyethylene fabric to prevent the water flow from washing away soil. With the cooperation and help of land owners along the brook, the Task Force has identified the most critical of the erosion sites and has completed the shoring up of the first two sites. Work on additional sites will continue this fall. 1. Two new Layer Aeration towers after delivery to the Washington Boat Launch. 2. 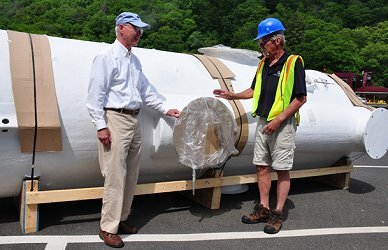 LWTF Executive Director Tom McGowan (left) being briefed by limnologist Dr. Robert Kortmann in front of the larger of the two new Layer Aeration Systems. 3. The larger Layer Aeration System at the Washington boat launch being lifted into position for towing to Arrow Point. 4. One of the new systems arriving at its new home east of Arrow Point. The LWTF Board of Directors viewed a presentation in December 2014 by its chief limnologist, Dr. Robert Kortmann, regarding the potential benefits of converting the land-based hypolimnetic withdrawal system on Arrow Point (also known as the "Frost Site") to an in-lake system similar to the Layer Aeration towers that currently operate in the New Preston basin of the lake. After much discussion and analysis of the costs and potential benefits, the Board voted to implement this conversion. Two new Layer Aeration Systems were ordered and delivered on May 28, 2015. They have been hooked up to a new compressor pump and are now operational. The larger of the new Layer Aeration towers is submerged on the east side of Arrow Point and the smaller tower is located on the shallower west side of the point. Their positions are made evident by the bubbling of released air, similar to the systems at the New Preston end of the lake. The previous Frost Site complex took water from the east side of Arrow Point and channeled it through a series of concrete baffles, removing nutrients and aerating the water before returning it on the west side of the point. The system was installed in the early 1980s and had an anticipated useful lifespan of 25 years. Although largely responsible for water quality improvements over that time, those benefits have levelled off and maintenance costs increased rapidly. In addition, Dr. Kortmann stated that the Task Force has shifted its emphasis to a more sophisticated water management strategy that requires timing and water-level adjustments beyond the capability of the Frost Site. Proposals under consideration for the Frost Site's concrete structure include the construction of solar panels to power the entire system and/or the possibility of nurturing the growth of zooplankton for possible re-introduction to the water. Zooplankton eat algae and therefore have a positive effect on water clarity. They said it couldn’t be done. We said differently. This year marks the 40th Anniversary of the Lake Waramaug Task Force. With your help and support, we did what many deemed “un-doable.” We restored Lake Waramaug to its rightful place as the most beautiful lake in New England. But our work is not over. We must remain vigilant and be proactive. Molly Butler Hart of Warren has been elected Chair of the Lake Waramaug Task Force, succeeding Linda Frank of Washington. Under the leadership of Ms. Frank for the last five years, the Task Force has continued to improve the quality of Lake Waramaug. Water clarity is now 8 to 10 feet in depth. 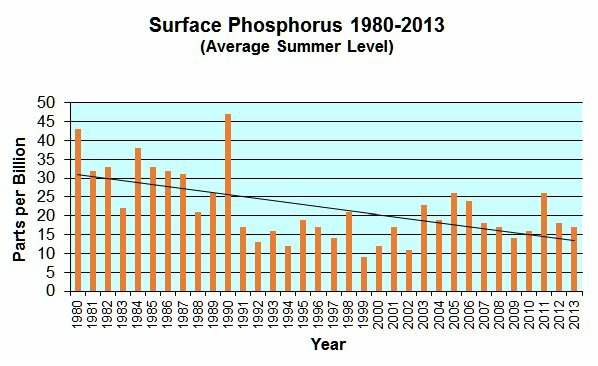 Phosphorous readings are 50% lower than they were 20 years ago. Harmful algae blooms are now less frequent, less intense and of shorter duration. The lake is relatively free of invasive plant species. The Task Force continues to improve the lake. This spring it installed a new and extensive aeration system designed to aid water clarity. An erosion control program is currently being launched to reduce phosphorous leakage into the lake. Molly Butler Hart, the new Chair, is the founding Executive Editor of Money-Media, which now operates as part of the Financial Times of London. She is also a board member of the Johns Island Community Service League. Other Task Force board members are: Anthony Bedini, Randy Bernard, Carolyn Brau, Kristen Browne, Jay Combs, Hilary Hopkins Criollo, Kenneth Hecken, Jim Hicks, Joan Larned, David Lindley, Richard Loughney, Kirby Mullen, David Robinson, Dr. Eric Salk, Dan Scherr, Lee Vance and Thomas Yamin. Tom McGowan is the executive director. We really didn’t see this coming quite so soon! In our last newsletter we explained certain blue green algae, present in Waramaug and most fresh water lakes, are now classified as bacteria and called cyanobacteria. When these “algae-bacteria” die off they release toxins. In very high concentrations this can pose a health threat if lake water is ingested. Well this summer this happened big time for the city of Toledo, Ohio. Toledo draws its water supply from Lake Erie. This August an algae bloom produced a large volume of cyanobacteria in the area of the Lake from which their water is drawn. As a result, the entire city of Toledo’s water supply was shut off for 3 days. The 2013 Annual Summary Report to the Task Force was prepared by the LWTF limnologist and chief scientific advisor Dr. Robert Kortmann and delivered on March 20, 2014. The report suggests a course adjustment for LWTF priorities with respect to phosphorus and water clarity, and provides some positive feedback on relatively new in-lake strategies during spring and fall. In addition, it focuses our attention on an evolving threat which has affected other lakes in the region and has drawn increased scrutiny from the scientific community and the state: the release of toxins during the die-off stage of cyanobacteria (often called blue-green algae). Water clarity and reduced concentrations of phosphorus have exhibited a close correlation over the years, in Lake Waramaug (see charts, right) and elsewhere. Trend lines for these measurements (Secchi disc readings and Total Surface Phosphorus) have, despite occasional anomalies, shown steady improvement and have provided the Task Force with the best testimony to the success of our work. However there has been a subtle shift in emphasis from maximizing to optimizing water clarity. It is believed that maintaining water clarity at a level of 6 to 8 feet (one-half the thickness of the epilimnion, or top warm thermal layer) is ideal for recreational lake activities and transmits some needed light to the metalimnion (mid-level) while providing a less suitable environment for algae and some non-native invasive plants. Recent experimentation with early spring and fall activation of the in-lake layer aeration systems have shown positive results. In the spring, water circulation is used to enhance the diatom habitat. This may actually sacrifice some clarity temporarily, while delaying and reducing the growth of blue-green algae (cyanobacteria) later in the season. In the fall, layer aeration is used to take iron from the hypolimnion (lower depths of the lake), which when oxidized can bind to and remove phosphorus from the upper levels. The report's cautionary note involves blue-green algae or cyanobacteria (inset, left) which has been observed to release toxins as it dies off. These toxins can cause serious illness in humans and animals, and the Connecticut DEEP and Department of Health have established guidelines for shutting down public beaches when concentrations are high. Connecticut was the last of the New England states to address this issue. Remarkably, there are no local laboratories capable of doing the required tests. Shipping samples elsewhere can be time-consuming. Hopefully, these testing problems are temporary. The good news is that Lake Waramaug's cyanobacteria levels have been consistently well below the danger threshold, due in large part to our long-term efforts to reduce phosphorus. But this recent focus on cyanobacteria toxins requires increased vigilance. For many years The Lake Waramaug Task Force has been concerned that more nutrients are reaching the lake from shoreline lawns. Manicured lawns are gradually replacing the native plantings along the shore that helped protect lake water quality by slowing down storm run-off and absorbing nutrients, especially phosphorus and nitrogen. These nutrients feed and spur the excessive growth of algae and aquatic weeds. In an effort to stem this trend and "turn back the clock", the Task Force conceived a plan to develop a model native shoreline buffer designed to protect water quality. The idea was to create an attractive shoreline of native plantings that would demonstrate how it protects the water and at the same time can be very attractive, provide low maintenance and low energy consumption compared to a suburban lawn. The model shoreline buffer was installed at 47 West Shore Road, with the support of the property's owners and local environmental organizations. It is hoped that interested lake residents will visit the site and consider native plantings for their own shorelines. This PDF lists the plants used on the site. Most are locally available. 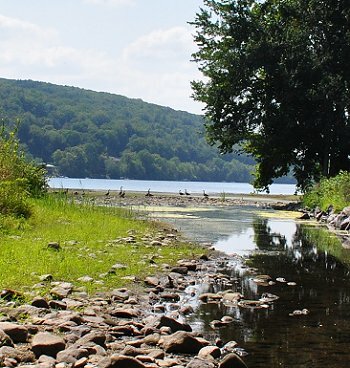 Please consider adopting this lakefront strategy for the long-term health of Lake Waramaug! On August 24, a perfect summer evening on Lake Waramaug's Arrow Point, ninety friends of the Mullen family, the Task Force and the Lake Waramaug Association gathered for a ceremony dedicating the LWTF's preserve at the end of the point to Peter P. Mullen. "This preserve is dedicated to Peter P. Mullen, in recognition of his 50 years of leadership and support in protecting Lake Waramaug, and to all who share his vision and commitment to preserve the health and beauty of this lake." Tom McGowan, Executive Director of the Task Force, spoke of the many contributions made by Mr. Mullen, who passed away in October of 2011. Those initiatives, all of them critical to sustaining the lake's ecological health, are in evidence around the shoreline and in the watershed, and include the purchase of the Arrow Point property that now bears his name. The preserve is the site of the Robert Frost aeration system, which plays a key role in the controlling of surface phosphorus and the reduction of algae growth. The Mullen family with the Peter P. Mullen dedication plaque. Left to right: Jeff Mullen, Billie Mullen, Kirby Mullen, Lucy M. Ball, Elaine M. Peer and Peter C. Mullen. In the spring of 2012, the Task Force embraced a Diatom enhancement strategy for the lake at the suggestion of our limnologist Dr. Robert Kortmann. Diatoms are a "good" form of algae that are prominent in cooler water in the spring. By activating our layer aeration systems earlier, we were able to expand those favorable conditions and hold off the transition to dominance of blue-green or "bad" algae. The trade-off yielded slightly poorer Secchi Disc readings of water clarity in April, followed by significantly better transparency from May through October (see chart). The enhancement approach will be used again this spring and Dr. Kortmann is considering additional strategies to build on these encouraging results. Mark Twain was right when he said, "If you don't like the weather in New England now, just wait a few minutes." The temperature swings, the intensity of the rains and wind have all been "interesting'''! But so far the water quality and clarity has held up despite these challenges. Even with high levels of phosphorous being washed into the lake feeding algae and weed growth, our clarity has been amazing. We recorded 9.1 feet of visibility at our two mid lake test sites on August 5 - an excellent reading at any time but especially in August.